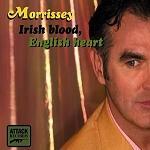 Morrissey - the name alone causes either adulation or loathing. Seven years since his last new material, the comeback album (You Are The Quarry) is nearly upon us, and Irish Blood English Heart is the taster. A more up-tempo number than he's known for, it's ludicrous, pretentious and as pompous as it gets (sample lyric: "I'm dreaming of a time when, the English, are sick to death of Labour, and Tories, and spit upon the name Oliver Cromwell"), which will either be music to your ears or utterly repulsive depending on your stance. Personally, I love it.